Save $20 off the regular price! 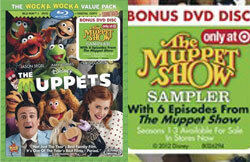 Order "The Muppets" 3 disc "Wocka Wocka Value Pack" with Blu-ray, DVD, digital copy and downloadable soundtrack. 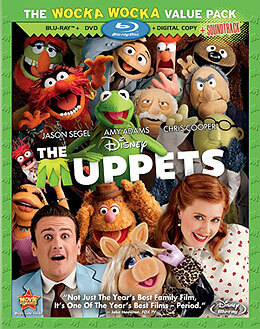 Phillip Chapman (March 16, 2012) - The long-awaited film “The Muppets” has been an extraordinary success. It is no understatement that if this film didn’t perform well that the Muppet characters might not have seen the light of day for years to come. 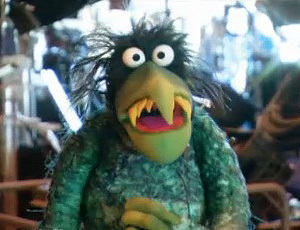 Fans had been following the development of the movie for more than four years, but after the domestic box office disappointment of only $16 million for “Muppets From Space” (1999), questions remained how widespread audiences would react after seeing the Muppets seventh feature film twelve years later. Literally a generation of kids barely knew who the Muppets were. Thankfully, the world triumphantly responded at the box office with a domestic gross of $88 million, the most ever for any Muppet movie. (“The Muppet Movie” in 1979 made $65 million.) The Bret McKenzie penned song, “Man or Muppet” delighted the hearts of the Motion Picture Academy enough to award the Muppets their first-ever Academy Award. 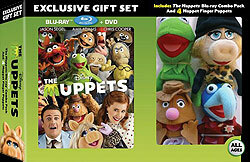 Disney is releasing four different versions of “The Muppets” on Tuesday March 20, two on Blu-ray and two on DVD. 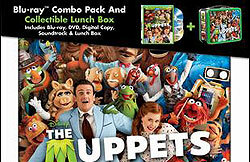 This review focuses on the Muppets Blu-ray “Wocka Wocka Value Pack” which includes a Blu-ray disc, DVD disc, digital copy disc (for playback on QuickTime and Windows Media devices) and a downloadable version of the soundtrack. 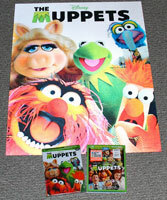 The film is the third Muppet movie to receive a Blu-ray release. “The Muppets Take Manhattan” (1984) was released on Blu-ray in August 2011 and “Muppets From Space” (1999) was also released on Blu-ray last year. Disney owns the rights to the four remaining Muppet films that haven’t yet seen a hi-def release: “The Muppet Movie” (1979), “The Great Muppet Caper” (1981), “The Muppet Christmas Carol” (1992) and “Muppet Treasure Island” (1996). Hopefully, these four movies will be released on Blu-ray soon along with future DVD releases of The Muppet Show. After the standard Disney previews, the main Blu-ray menu shows the Muppets in their theater seats as the camera pans across the audience. The menu is done very well as it balances showcasing great background material while being very entertaining at the same time. By now, you probably know all about the story. 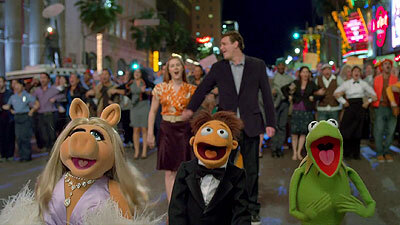 Gary (Jason Segel), Mary (Amy Adams) and Muppet Walter (Peter Linz) travel to LA to visit the Muppet Studios. There they discover that the beloved Muppet Theater is in danger of being destroyed by oil tycoon Tex Richmond (Chris Cooper). In order to save the theater the Muppets return and put on “The Muppet Telethon” a re-branding of the original Muppet Show. The overt irony of the new movie is that Gary, Mary and Walter remind the Muppets of their roots and what made them great. All the while, Disney’s goal is to remind the audience why the Muppets bring hope to the world and are needed for today’s generation. In a cynical world with cheap entertainment and values, the Muppets serve as a catalyst to bring out the best in ourselves. The Muppet performers do an incredible job here as well, especially when one realizes that Dave Goelz (Gonzo, Bunsen, Waldorf) is the only Muppeteer still performing his original characters. Steve Whitmire (Kermit, Beaker), Eric Jacobson (Miss Piggy, Fozzie), Matt Vogel (Floyd, Uncle Deadly), Bill Barretta (Rowlf, Dr. Teeth) and David Rudman (Scooter, Janice) seem totally comfortable in their current roles. And of course, Peter Linz (Walter) helped capture the joy of Muppet fandom in a simple character that reminded the world why it’s still great to be a Muppet fan. Guys, we applaud you, you are the real stars of the movie. The video quality is outstanding. Seeing the Muppets in full 1080p, MPEG-4 AVC is nothing short of amazing. Human skin tones are natural. Black levels are rich and dark which makes the brightly colored Muppets pop off the screen. You’ll notice details that you likely overlooked in the theater especially in the craftsmanship of the puppets themselves. Even the clarity of background scenes will get your attention. The Blu-ray is on a 50 gb dual-layer disc while the DVD is on a 8.5 gb dual-layer disc. The Blu-ray 7.1 DTS-HD soundtrack is very good as well. Finally, we have a real Muppet soundtrack that takes full advantage of surround sound. Thankfully, the side and rear speakers help immerse you in the soundfield unlike any other Muppet film. English, French and Spanish audio tracks are selectable from the main menu. The movie runtime is 1 hour, 42 minutes and 37 seconds. 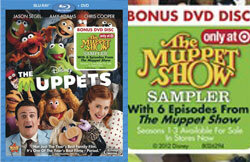 The most notable difference casual fans will notice between the four various releases of “The Muppets” is the inclusion of bonus features. Only the blooper reel makes its way on to the DVD release unfortunately. Everything else is included on both of the Blu-rays with the exception of “Inside Walter’s Trailer” (digital copy only). 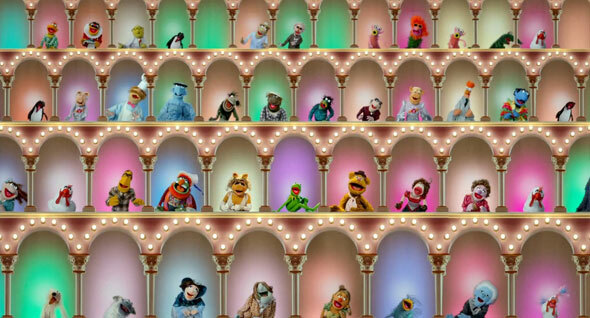 Many fans were hoping to see an official advance promo for The Muppet Show Season 4 on DVD. Sadly, none was to be found in this release. Scratching the Surface: A Hasty Examination of the Making of The Muppets (Hosted by JG) (15:14) - A teal Frackle named JG (performed by Tyler Bunch), who is the "the unit production manager monster", hosts this excellent segment even though it doesn’t go very deep in the making of the film. 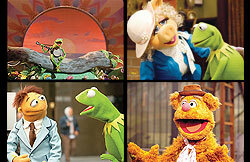 Cast and Muppet interviews are featured. It seems to be a parody of "Hitchhiker's Guide to the Galaxy." Go into it thinking this is purely for entertainment value and you’ll enjoy this segment tremendously. Frankly, this should’ve been on the DVD with the blooper reel. Fans will be delighted to see several old favorites with extended lines including Lew Zealand, Uncle Deadly and even the rarely seen Droop. Unfortunately, Disney doesn’t like to break the “fourth wall” by showcasing the puppeteers in interviews and behind-the-scenes footage. It’s a shame the puppeteers aren’t shown performing their craft. It would add so much to this behind-the-scenes featurette. - "Life's A Happy Song Missing Verse"
- "The Complete Muppet Telethon Opening & More"
I don’t want to give to much away with these scenes, however, there are several moments that will be a true delight for fans. "The Complete Muppet Telethon Opening & More" reveals part of The Muppet Show set never-before-seen and is a fantastic bit with rare character dialogue that thankfully we all get to see. Manyother prominent scenes were filmed but unfortunately not included on the Blu-ray extras. Most notably I was disappointed that Kermit and Piggy's break up flashback was not here. The Muppets novelization describes Kermit and Miss Piggy having a fight after their wedding in “The Muppets Take Manhattan”. Kermit then fires Miss Piggy for tricking him into marrying him and she moves to Paris. This might’ve been dropped due to the “wedding ambiguity” subject, but regardless fans deserved to see this. Also, it would’ve been nice to have the original ending of the film included as well. Several of the original ending scenes were later re-worked and reshot. Originally, hecklers Statler and Waldorf gave the Muppets the additional dollar needed to save the theater. This would’ve given them more of a redeeming role (like Uncle Deadly). Additional commentary from director James Bobin and writers Jason Segel and Nick Stoller would’ve made this a home run. The Swedish Chef also had a kitchen sketch in the telethon that was cut. An extended Muppet Labs recruitment segment and a scene with Clifford was also reportedly cut from the movie as well. Explaining Evil: The Full Tex Richman Song (2:29) - While I’m not fond of Chris Cooper’s rap (some people really like it though), showing him as a child and his reasons for hating the Muppets added greatly to his character. Maniacal laugh indeed. A Little Screen Test on the Way to the Read-Through (3:08) - The albeit brief screen test was fantastic. I only wish scenes from the actual read-through were shown as well. Disney probably didn’t want to reveal the Muppet performers as they were in full view during the read-through. 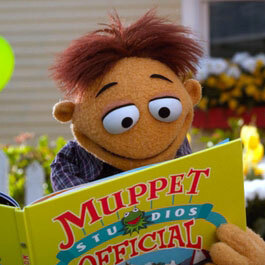 Reportedly, Jason Segel cried when he first heard Kermit reading his lines. How great would it have been to have seen his excitement of meeting the Muppets face-to-face? And speaking of screen tests, I was hoping to see the first Jason Segel and Walter screen test when various performers were auditioning for the role of Walter. Kermit and Jason Segel also sent Amy Adams a video petitioning her to play the role of Mary in the film. This would've been a nice inclusion as well. The Longest Blooper Reel Ever Made (In Muppet History*) *We Think (8:32) - These bloopers are very good but per Disney’s preference, all of the Muppets are in character. No performers are in sight. Spoof Trailers - Fans will be delighted to see all of the parody trailers included here including two that are seeing the light of day for the first time, “Rise of the Muppets” and “Never”. The new trailers play first on the Blu-ray, I would’ve preferred the trailers presented in chronological order with the “Green with Envy” trailer first and the others following after. A separate commentary with several Muppeteers (or even Muppets) would've been fantastic. Hearing their insights on performing and working on this project would’ve been incredible. Even if some of the Muppets themselves would have dropped in on the Segel, Bobin and Stoller commentary it would've made it even better. Disney Intermission (Pausing the film provides interaction) - If you pause the Blu-ray, you’ll see an unexpected bonus. Various Muppets will entertain you while you wait to resume the show. Who thought pausing a movie could be so much fun? Easter Eggs - The following Easter Eggs are included along with tips on accessing the bonus material. Inside Walter's Trailer - This is only available with a digital copy, viewers get a look inside Walter’s trailer in between scenes. There are also several limited-edition “exclusive” versions of the movie with bonus items from select retailers. “The Muppets” is a film that you’ll watch again and again. It’s more than a relaunch of the Muppet franchise, it’s a reminder of Jim Henson’s vision for brining hope to the world for a new generation. 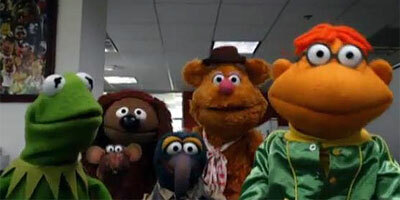 Due to the overwhelming positive response, Disney is already working on the next Muppet film. The new movie is slated to be a separate film verses a continuation or sequel to “The Muppets”. Since Disney played many retro cards recreating “The Muppet Show” and numerous references to prior Muppet movies, it will be interesting to see how they pull off the next project while keeping things fresh. And you can bet Disney will quadruple the Muppet merchandise in the months and years to come. 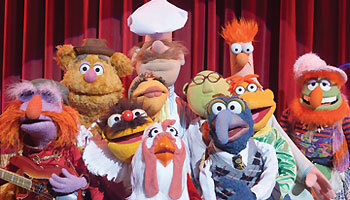 We are seeing a Muppet revival and excitement unlike anything we’ve seen in more than 30 years. Life’s a happy song, indeed.